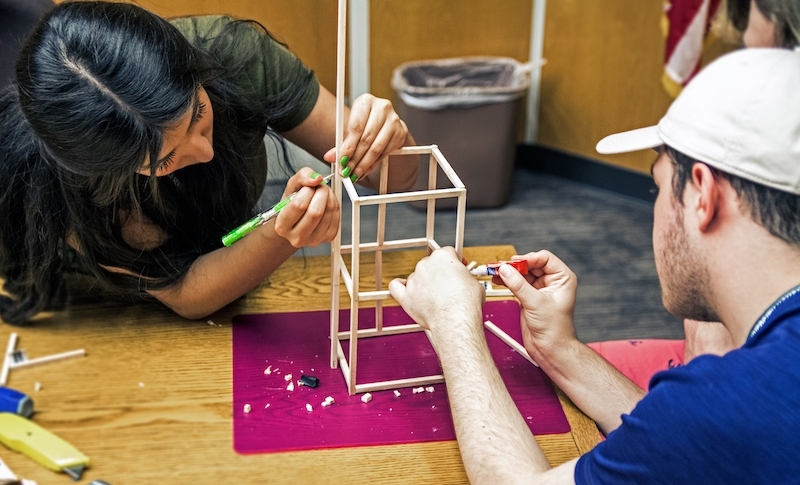 Engineering Summer Academy participants build balsa wood towers as part of the "Structure and Function" track. The College of Engineering bid farewell to the last of the more than 300 students it hosted this summer on Saturday, wrapping up the final summer camp of the 21 camps it coordinated. Through camps in seven locations across the state, the college reached students in Arkansas and beyond. Engineering Summer Academy, which concluded Saturday, brought over 70 high school students to campus to participate in activities related to four interdisciplinary themes: Living Systems, Structure and Function, Non-Living Systems, and Modeling and Simulation. This new summer academy format exposed students to the research of faculty and graduate students from the biomedical, chemical, civil, electrical, industrial, and mechanical engineering departments. Donovan Stockdale, who was awarded a scholarship to attend the camp, said he expected to only get an introduction of engineering, but instead was able to explore graduate-level concepts early in the week. "Usually you don't expect that. I really enjoyed the chance to better my education and get a better understanding of engineering," said the junior from Jonesboro High School. Earlier in the summer, the college hosted middle and junior high school students, beginning with the Discover and Explore Engineering camps. The innovative curriculum was designed to engage students with the themes "Food Engineering: From Farm to Table" and "Mission to Mars." Later, at the GirlTREC and Soaring High in Engineering programs, female students explored the themes of transportation engineering and engineered solutions to reduce the threats to pollinating species like bees. Robotics continued its annual summer showcase, beginning with Robotics Engineering camps for students entering 5th through 8th grade and ending with FIRST LEGO League Jr. camps for the region's elementary students. The Don Tyson School of Innovation in Springdale hosted the campers who, this year, had more opportunities to attend a session. Keegan Riley, a junior computer engineering student, assisted the youngest campers in learning about robots. He said that watching the kids' creativity is his favorite part of working with the students. "It's important for them to get an early exposure to STEM. I wish I had these opportunities when I was their age," said Riley. The College of Engineering also hit the road, debuting the Inside Engineering camp for 6th through 9th graders in Batesville, Bentonville, Blytheville, Camden, and Hot Springs. Students in these camps had the opportunity to "Engineer Entertainment" as they designed and built a theme park. This continued expansion would not have been possible without sponsors and partners. Engineering camp sponsors include Altice/SuddenLink, MarTREC, the National Park College Innovative Technologies Center, and the Women's Giving Circle. Partners, who provide facilities and other resources, include Haas Hall Academy, KIPP: Delta Public Schools, and the University of Arkansas Community College at Batesville.